The new episode of Roseanne turns to Islamophobia. It does it responsibly. The season has already tackled problems of class, political ideology, race, sexuality, immigration and veteran affairs. (Spoiler alert!) This new episode, “Go Cubs,” introduces the Conners’ new neighbors, the Al Harazis, a young Muslim immigrant couple from war-torn Yemen and their son. From the start, conflict ensues between Roseanne, who is suspicious of the neighbors, and her sister Jackie and daughter Darlene. Jackie and Darlene find her suspicions unwarranted and motivated by bias. In the opening scene, for example, Roseanne suspects that the Al Harazis are terrorists, bent on making a bomb. Jackie challenges Roseanne by telling her she cannot just spy on people because they are Muslim. Later, Roseanne’s granddaughter wants to make a late-night Skype call to her mother who is serving a tour of duty in Afghanistan, but is unable to acquire Wi-Fi access. Roseanne makes several crude guesses at the Al Harazi’s password, including “DeathToAmerica123,” much to Darlene’s dismay. Darlene briefly pretends the password works only to forcefully point out to Roseanne that it was an absurd guess. These scenes illustrate the kind of anti-Muslim sentiment held by many individuals across the U.S. The characters represent people we find in many American families. First, there is the blunt, prejudiced figure driven largely by inexperience and fear of the unknown, represented by Roseanne. Second, there is the apologetic figure, attentive to prejudice, but with some hidden biases of her own, represented by Jackie. Finally, there is the neutral, open-minded figure who is not alarmed when people are a bit different from her, represented by Darlene. An important element in these scenes is Darlene and Jackie’s outward disapproval of Roseanne’s bigotry. Through such outward reproach, the writing establishes that it is not socially acceptable to be xenophobic and that there are social consequences for behaving in discriminatory ways. Roseanne eventually visits the Al Harazis herself, at 2 AM, to request their Wi-Fi password. Roseanne knocks on the door equipped with a baseball bat. The Al Harazis answer the door armed with a bat of their own. Though depicted humorously, the moment exemplifies their mutual fear of the “other.” Roseanne anticipates terrorists. 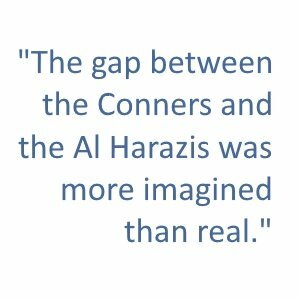 The Al Harazis, jaded by so many encounters, anticipate Islamophobic violence. Roseanne’s transformation and recognition of her biases culminate in an encounter with Mrs. Al Harazi at the supermarket. In the checkout line, Mrs. Al Harazi has insufficient credit on her EBT card to pay for her groceries. The cashier responds with some discriminatory remarks, frightening Mrs. Al Harazi. Roseanne intervenes, pays the remainder of Mrs. Al Harazi’s bill and reprimands the cashier for her bigotry. Roseanne’s transformation in the episode is powerful. The writing demonstrates that Roseanne and Mrs. Al Harazi identify with one another on the basis of their economic class. The scene also illustrates that Roseanne has learned her Muslim neighbors deserve to be treated with dignity, not bigotry. Finally, Roseanne models the kind of behavior socially responsible citizens should engage in: Show compassion to the victim of discrimination and stand up to the perpetrator of the discrimination. 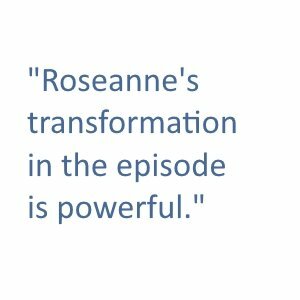 The end of the episode brings Roseanne’s transformation full circle. The closing scene includes a playful interaction between Roseanne and Mr. Al Harazi, who comes to her house at 2 AM to repay her for the groceries. Roseanne and Mr. Al Harazi appear to have a personal and friendly connection with each other – a stark shift from their initial interaction. Ultimately, the episode depicts a transitional narrative. Roseanne, an engaging character to whom many can relate, evolves from holding biased views of her Muslim neighbors to recognizing and defending their humanity. Timely and pertinent to the issue of Islamophobia, the episode’s underlying message can be generalized to other social groups. And the message is simple and powerful: It is difficult to dehumanize and stereotype other people when we get to know them on a personal level. 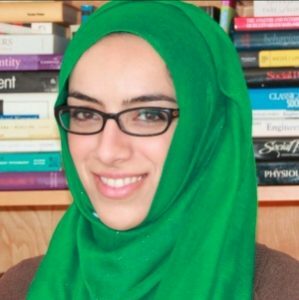 Sohad Murrar is a Ph.D. candidate in Psychology at the University of Wisconsin-Madison. Her research focuses on developing and testing innovative social interventions to improve intergroup relations and generate prosocial change. In particular, she examines the role of entertainment media and social norms in influencing intergroup attitudes. Sohad received her B.A. from Northwestern University in 2010, her M.A. from the University of Chicago in 2011, and her M.S. from the University of Wisconsin in 2014. Comments? Please visit our Facebook page to contribute to the discussion! This is one of two blogs about this episode. Read Amir Hussain’s post. If you’d like to read Lear Center Director Marty Kaplan‘s take, it’s here.